Proactive Monitoring & Management | Consolidated Technologies, Inc. : Consolidated Technologies, Inc.
At CTI, our client’s priorities are our priorities. CTiQ Proactive Monitoring solutions bring our clients’ networks to life for them. The results are a 24/7/365 monitoring solution customized to each client’s needs and support requirements. CTI Proactive Monitoring is a standalone Unified Communication Monitoring solution that takes the guess work out of Root Cause Analysis. Whether it’s a call-server such as Avaya IP Office or Avaya Aura Communication Manager, or multi-vendor Unified Communications environments that utilize Presence Servers or Firewalls, Ethernet Routing Switches or Windows Servers, CTI Proactive Monitoring dramatically reduces the time necessary to manage today’s Unified Communications architectures. Essential Monitoring for IP PBX systems. Enterprise Level Monitoring for the converged single or multi-vendor Unified Communications networks (covers Avaya, Microsoft, Cisco UC stacks, as well as any SNMP Manageable device). Includes the features and vendor coverage of Proactive Complete with higher level forensics in VoIP Quality Management as well as offering higher level functions as free entitlements. A deep packet inspection capability with an Integrated Correlation Engine, dramatically reducing the time necessary to diagnose complex Unified Communications networks. When Call Servers are supported by PRI Circuits, SIP Trunks, SBCs integrating with Corporate Networks, automating the correlation between failure points finds the “Needle in the Haystack”. No matter what level of software clients choose, CTiQ Proactive Monitoring is directly linked to the CTI Technical Services Organization, allowing them to be aware of issues, start investigations, and fix problems all without requiring the client to call in. 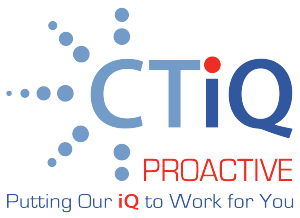 This is CTiQ Proactive Monitoring and Management. Our Managed Voice Server solution combines 24 x 7 x 365 monitoring with real time problem response and rapid resolution. When a service event occurs, your system is programmed to outcall our Monitoring Servers, which then capture and acknowledge alarms and automatically dial back into the system. The CTI Monitoring Servers then perform pre-defined tests on the component that triggered the alarm. If the errors and alarms are not cleared remotely, a technician is assigned to resolve the problem immediately. Often, we are able to resolve the issue before you are aware of it and before it interrupts your workflow. After the fact, CTI provides customers with reports by system, report group, port utilization on all alarms.